Hello, this is a feature that will run through the entire season and aims to recap the weekend’s events and boils those events down to one admittedly superficial fact or stupid opinion about each team. Feel free to complain about it. The long-standing joke in the NHL is that the Southeast Division is the worst in hockey by a mile. And while that hasn't always been categorically true, it's certainly been true enough over the years that, unlike the belief that Sidney Crosby is a diving whiner, it's not always easy to separate legend out from reality. This year, however, there have been no such difficulties. The race to the bottom in the Southeast has reached an unfortunate nadir in the past several days, as the Capitals now lead it with a point total which equals that of the New York Islanders. That point total is just good enough to get them into the playoffs even under rational circumstances — for example, not giving a division winner an automatic top-3 seed just for fun — but it's also tied for 14th league-wide. Were you to look up ignominy in the dictionary, you'd see a picture of Adam Oates sneaking into this prime playoff spot, while still scowling over yet another defensive breakdown by these 2013 division-leading Caps, who have conceded 110 goals in just 39 games. The Capitals, unlike the teams ahead of them and also immediately behind them in the standings, have the luxury of playing Carolina, Florida, Tampa Bay, and Winnipeg four and five times this season. Their record against those teams, including last night's result against the Lightning, is 12-3-0. That should tell you everything you need to know about how fraudulently this division title is going to be won by whichever team backs into it least-hard: The Caps' record against teams outside the Southeast is a brutal 8-14-2. It doesn't really seem fair that, simply on the basis of geography, a team that actually deserved to win home ice by racking up a large number of points against teams that wouldn't struggle against middle-of-the-pack AHL sides won't be able to do so. People talk an awful lot about how the Maple Leafs aren't even that good, and they're probably not wrong, but they have 46 points playing in the only division in hockey with two 50-point teams. This is far more of an accomplishment than leading the only one with three teams at 34 or below. And only doing it by six points. I'm sure there have been worse-performing divisions than this one throughout NHL history, but what I doubt is that they've been quite this brutal to watch. These are some defensively ugly teams, as evidenced by the fact that Carolina, Winnipeg and Florida are in the bottom six in the league in goal differential, ranging from minus-18 to minus-37, respectively. That seems like a pretty good reason all other teams in the East are a combined 74-40-11 against these five teams, good for a .636 winning percentage, or a pace for about 104 points in an 82-game season. Only one team in the East (Buffalo, of course, at 2-8-2) has taken fewer than half its points against Southeast opponents. The good news, if you want to call it that, is this type of postseason abomination, which cropped up to a lesser extent last year when the Florida Panthers sneaked in as the No. 3 seed when it should have been eighth, is in its dying days. With the conference realignment, flawed though it may be, there will at least be a far smaller chance that teams as bad as all this will creep into the postseason through this silly backdoor. Obviously the problems with the new playoff format are myriad, and will probably only be sorted out by some sort of cockamamie Western expansion (which may never come), but it's at least slightly more of a meritocracy than the current system. This is true not only because it's the three best in each division getting in, as well as the two best remaining teams, but Washington would be well back of a playoff spot also by virtue of its not getting quite so many easy W's against the weaker siblings in its current division. Prior to last night's games, the team with the toughest schedule in the Southeast was Winnipeg, and even then, it was 25th in the NHL. In a way, I kind of feel bad for whoever comes out of this division, whether it's Washington or Winnipeg, because they'll have to face an actual good team that has played an actual tough schedule. And while anything can happen in a seven-game series (see also: Florida Washington somehow advancing out of the first round last year), the likelihood is that no matter how hot they go in, things are just not going to go well. But fortunately for them, and everyone else in the hockey world, it'll be the last time ever. Anaheim Ducks: It looks like the Ducks could be in Penguins-without-Crosby trouble if Ryan Getzlaf is out for an extended period. Hopefully his missing the last two games was just a precaution. Boston Bruins: Tyler Seguin was demoted to the Bruins' third line for practice on Sunday, which is a fairly reasonable reaction considering he didn't even attempt a shot on goal against Montreal the night before. Not a great showing as the pivot for Brad Marchand and Jaromir Jagr. Buffalo Sabres: The Sabres picked up four points in the two games since they traded away some of their better players, because the team just wants to focus on winning. "The postseason remains a long shot, but the Sabres are far from eliminated. They are in 12th place, six points behind the eighth-place New York Islanders with one fewer game played." Well no I mean they're out, though. Like, not mathematically, but they're out. Obviously. Calgary Flames: Hello, Max Reinhart. Welcome to the NHL. Meet Messrs. Alex Burrows and Dan Hamhuis. They'll be blowing your doors off for a goal 34 seconds into your first game. You'll fit right in with Calgary. Carolina Hurricanes: The Hurricanes have lost seven straight games at home. They've won just seven of 19 there, and haven't lost outside regulation yet. Just 14 points from 19 home games. No wonder they're in 13th. Chicago Blackhawks: After giving up six shots on Nashville's first power play, it looked like the Blackhawks were in for another ugly defensive performance. But then they allowed only 20 for the game, so the turnaround was pretty acceptable, especially after giving up 38 to Columbus in their previous game. Colorado Avalanche: It's been a "give-up-a-goal-like-this-to-Boyd-Gordon" kind of season in Colorado. This is the absolute perfect encapsulation: Clearing attempt off an Avs skate, no one even bothers skating hard after the dump, and a player like Boyd Gordon scores from the lowest angle imaginable on a bank-in off Semyon Varlamov. Columbus Blue Jackets: I wonder how often Marian Gaborik has paid attention to the crowds in Columbus. Before Sunday's evening tilt with Minnesota, he said: "It’s my first game at home. Hopefully the building's going to be jumping. We’ll try to make it a good one." They're averaging fewer than 14,000 a night, 28th in the league. Dallas Stars: Joe Nieuwendyk says after all those trades, the team has a "good feeling" around it, but this is also the guy who traded Jaromir Jagr for Lane MacDermid, so I'm not putting too much stock in his opinions. Detroit Red Wings presented by Amway: Everyone had lots of good stuff to say about Danny DeKeyser's 17-minute NHL debut on Friday night, and as a show of just how smart he is, he even successfully ignored whatever dumb stuff Ian White had imparted about how to be a successful defenseman in this league. Most of it probably had to do with, "Make sure you play with Nicklas Lidstrom." Edmonton Oilers: Taylor Hall says the Oilers are always a little nervous before games these days, because they know every one is essentially a playoff game at this point. Well cheer up, TayTay. If you guys keep playing like you did against Vancouver and Los Angeles, that won't be the case much longer. Florida Panthers: Kevin Dineen didn't send anyone over to serve Erik Gudbranson's major penalty in the first period of Saturday night's game. So when it expired, no one came out, and that gave the Caps an extra 18 seconds of power play time. During which Quinton Howden took a hooking minor. And the Caps scored on the resultant power play. This is Panthers Hockey to a T.
Los Angeles Kings: Dustin Brown has a bit of a reputation as being a borderline player at times. In my opinion, though, there's a line you want to play on, and up to. Helicopter-spin-high-sticking your teammate crosses it. C'mon now. Minnesota Wild: The Wild signed University of Minnesota super-forward Erik Haula to a two-year entry-level deal, making him the fifth Gopher to leave school early since they were bounced from the NCAA tournament last weekend. Oof. Montreal Canadiens: While most Habs fans would normally love to see Alexei Yemelin clobber Milan Lucic, but it didn't work out so well on Saturday. They're still waiting to hear back on the extent of his injury. Nashville Predators: "Don't expect Shea Weber to save the Flyers." Was anyone on earth expecting that? This article is, approximately, nine months too late. New York Islanders: I mean this is nice work by Kyle Okposo and everything, but isn't Matt Carle a highly-paid NHL defenseman? Did I dream that? New York Rangers: Has anyone noticed the Rangers haven't lost at actual hockey (the shootout doesn't count) since they traded Marian Gaborik? Man, they must have really hated that guy. Ottawa Senators: Has anyone noticed lately that Kyle Turris has been pretty bad: No points in his last four games, no goals in his last eight? Oh, yes? Okay good. Jason Spezza isn't even back skating yet, so you better hope for a turnaround quick. Philadelphia Flyers: Speaking of University of Minnesota players skipping town, one of those five was defenseman Mark Alt. I'm actually kind of surprised he's reporting to Adirondack, just because the Flyers are currently playing a small dog on the third pairing. Phoenix Coyotes: Today is Day No. 241 since Jude LaCava of Fox 10 in Arizona said Greg Jamison would have the deal for the Coyotes sewn up within the next five days. And wow, am I ever getting sick of Mike Smith. We get it, bud, guys are always targeting you. Pittsburgh Penguins: Seriously though, just give Crosby the Hart. How is it even up for debate at this point? San Jose Sharks: Speaking as we were of college signings, the Sharks got two free agents in recent days: forward Rylan Schwartz from Colorado College and defenseman Eriah Hayes from Minnesota State. Goalie Troy Grosenick from Union is expected to sign any day now. St. Louis Blues: Why has Chris Stewart been better this year? He stopped eating brown rice. Seriously. Tampa Bay Lightning: This is maybe the greatest headline for a story about the Ben Bishop trade. Toronto Maple Leafs: Pretty amazing breakdown of the ways in which the Maple Leafs continually try to brush concussions under the rug or otherwise mishandle them. It's amazing this is a thing that can be written about concussion protocol in 2013. Vancouver Canucks: Alain Vigneault is now the Canucks' longest-tenured coach ever with 530 regular season games under his belt. Of those, 308 are wins, and that's not so bad. Washington Capitals: Mike Green is on a nice little productive run here, scoring five goals and adding two assists in his last five games. Winnipeg Jets: Doesn't seem like the greatest idea to leave Dustin Byfuglien on the bench for too long. We've seen what happens when he's not skating regularly. Feel free to make a big deal about the move to get around Filip Kuba, but it's the shot that really makes this second goal of his hat trick on Saturday jaw-dropping. Wowie. 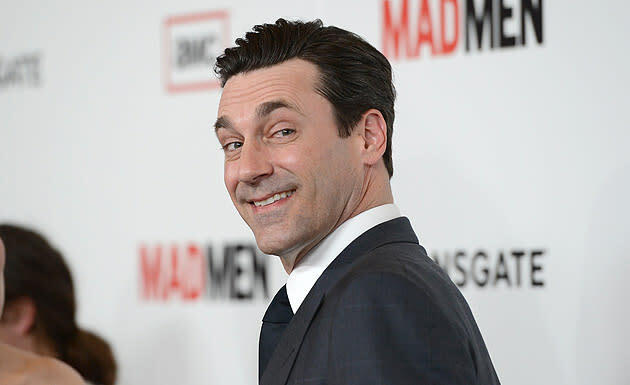 Mad Men is back and that's better than any hat trick or shutout sorry. 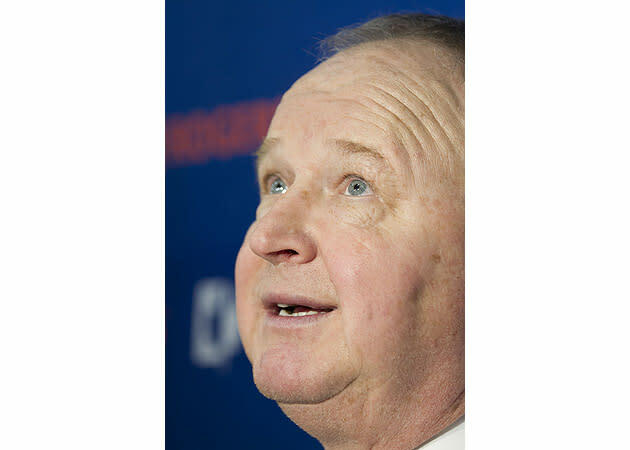 "I have a theory on concussions," is not usually the way you want a person with no medical background to start a line of conversation, and thus did Randy Carlyle — who's not even a particularly good NHL hockey coach, let alone neurologist — begin to seriously embarrass himself. "I think the reason there’s so much more of them — obviously the impact and the size of the equipment and the size of the player — but there’s another factor: everyone wears helmets, and under your skull when you have a helmet on, there’s a heat issue. Everyone sweats a lot more, the brain swells. The brain is closer to the skull. Think about it. Does it make sense? Common sense? I don’t know if it’s true, but that would be my theory. Heat expands and cold contracts. The brain is like a muscle, it’s pumping, it swells, it’s a lot closer to the outside of the skull." How no one in that media scrum said something along the lines of, "Uh yeah, Randy, quick follow-up here. Just something I'm wondering: What the actual [expletive] are you talking about?" I thought he was stupid when he said he'd keep playing Nazem Kadri 15 minutes a night because he had that hat trick against the Islanders, but this is entirely new and scary territory of almost incredible dumbness. User "lifeisruff" is intent on shopping Tyler Ennis around. He always leaves the TV on the Game Show network. I'm not sure why it bothers me, but it does. Ryan Lambert publishes hockey awesomeness almost never over at The Two-Line Pass. Check it out, why don’t you? Or you can e-mail him here and follow him on Twitter if you so desire.